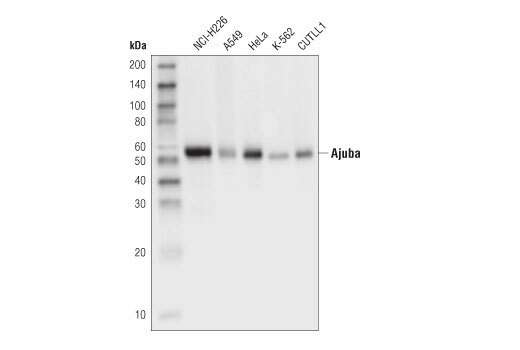 Western blot analysis of extracts from various cell lines using Ajuba (D4D8P) Rabbit mAb. Immunoprecipitation of Ajuba protein from PANC-1 cell extracts. Lane 1 is 10% input, lane 2 is Rabbit (DA1E) mAb XP® Isotype Control #3900, and lane 3 is Ajuba (D4D8P) Rabbit mAb. 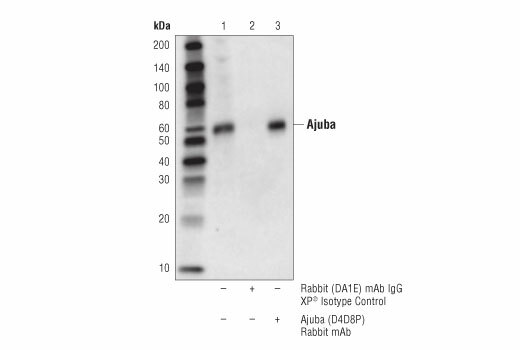 Western blot analysis was performed using Ajuba (D4D8P) Rabbit mAb. Ajuba (D4D8P) Rabbit mAb recognizes endogenous levels of total Ajuba protein. Monoclonal antibody is produced by immunizing animals with a synthetic peptide corresponding to residues surrounding Arg77 of human Ajuba protein. Ajuba belongs to the Zyxin/Ajuba family, members of which include LIMD1, LPP, Trip6 and Zyxin. Three LIM domains at the carboxy-terminus characterize this family of proteins. Zyxin/Ajuba family members associate with the actin cytoskeleton, are components of both cell-cell junction adhesive complex and integrin-mediated adhesive complex, and shuttle in and out of the nucleus (1). Ajuba is involved in Rac activation during cell migration and activates Aurora A in order to commit to mitosis (2-3). Ajuba and its family members also have an amino-terminal proline-rich pre-LIM region, and Ajuba augments ERK activation in a Ras-dependent manner (4). Feng, Y. and Longmore, G.D. (2005) Mol. Cell Biol. 25, 4010-4022. Pratt, S. J. et al. (2005) J. Cell Biol. 168, 813-824. Hirota, T. et al. (2003) Cell 114, 585-598. Goyal, R. et al. (1999) Mol. Cell Biol. 19, 4379-4389.